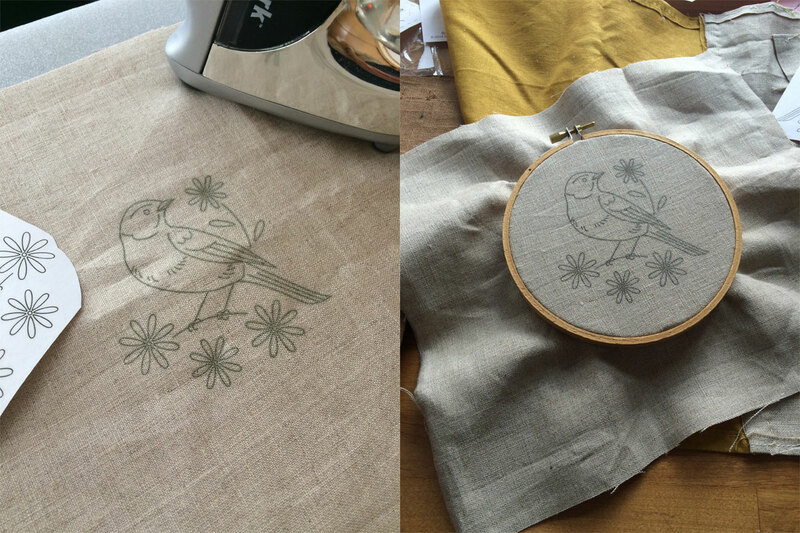 It’s the perfect season for crafting: there’s fresh hope and creativity in the Springtime air. It’s just the time to rummage around in your craft supplies and see what’s up. I happen to have way too many fabric scraps; combine that with the amazing line of crafty kits from Sublime Stitching and you’ve got a project on your hands. 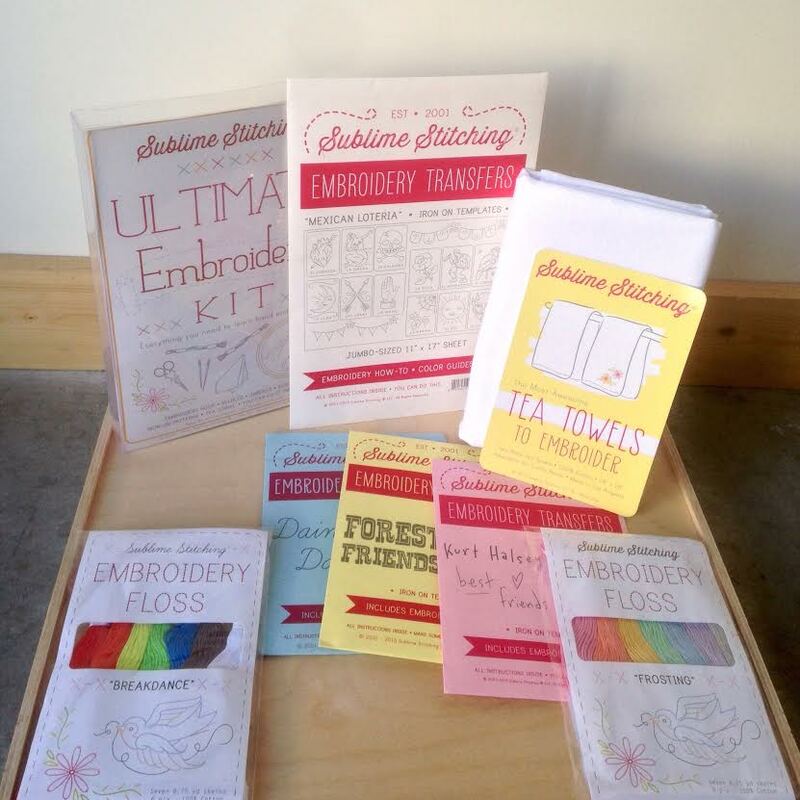 Sublime Stitching offers all kinds of cool stitching kits and supplies. 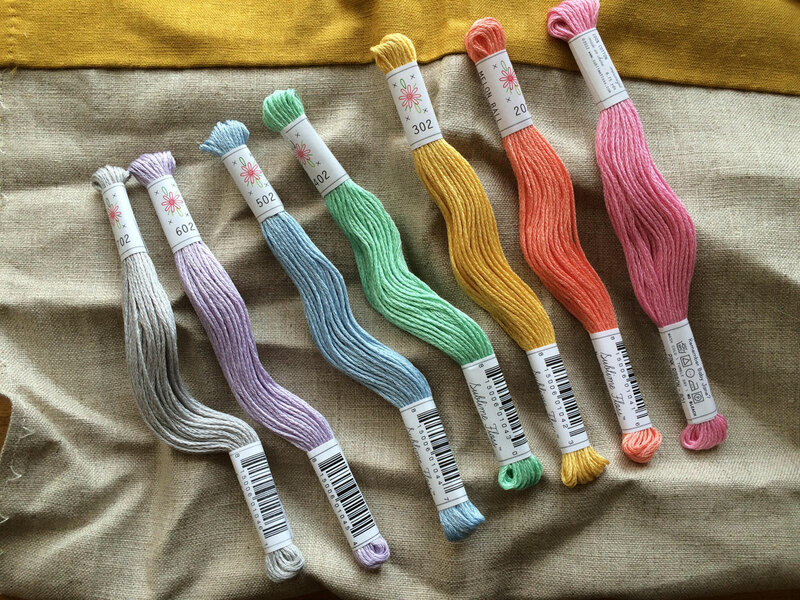 I chose the “Song Birds” embroidery transfers and the “Frosting” set of embroidery floss. I get so giddy at the prospect of a new project! So: before getting started on any craft project, I have one important recommendation. Okay, maybe two. 1. Clear yourself off a nice big workspace. 2. Have all your tools ready to go. Even though we only need the basics, I’m still knolled out. I would have included my cup of coffee, too, which is an important tool, but I already finished it. Also not pictured, an iron and ironing board. Knoll (verb): the process of arranging related objects in parallel or 90 degree angles as a method of organization. So before you start, rock and knoll. Be sure you knoll what your doing. Stop, drop and knoll. Okay you get the point. What we’re doing today is going to be pretty basic. I’m going to use some iron on transfers to make a pattern along which I will stitch using a couple different kinds of stitches. 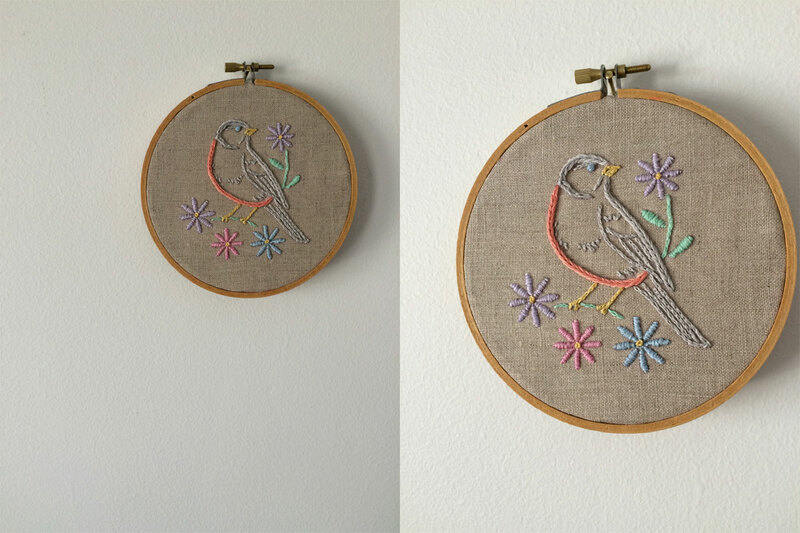 When we’re done, we’ll use the embroidery hoop as a “frame” and it’s ready to hang! 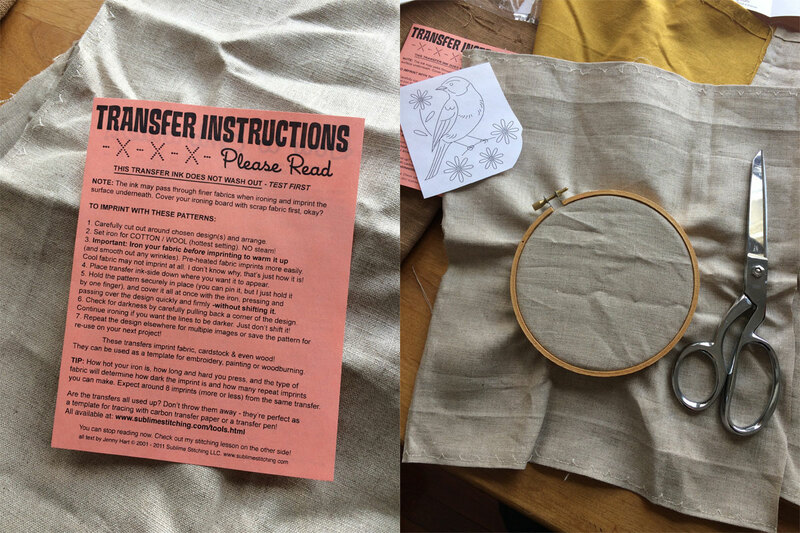 Every Sublime Stitching kit comes with some great (and funny) instructions to complete your project, but I’ll also be referencing the Reader’s Digest Complete Guide to Needlework. 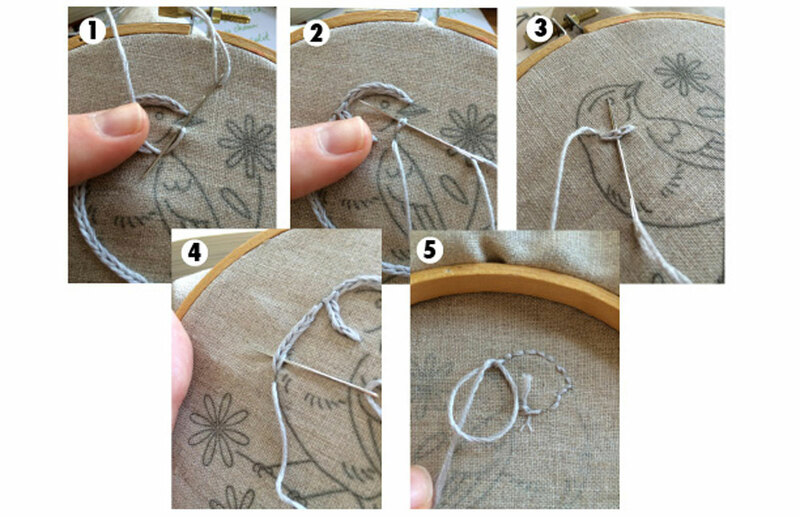 It is THE BEST; really great illustrations on how to do a ton of different stitches. 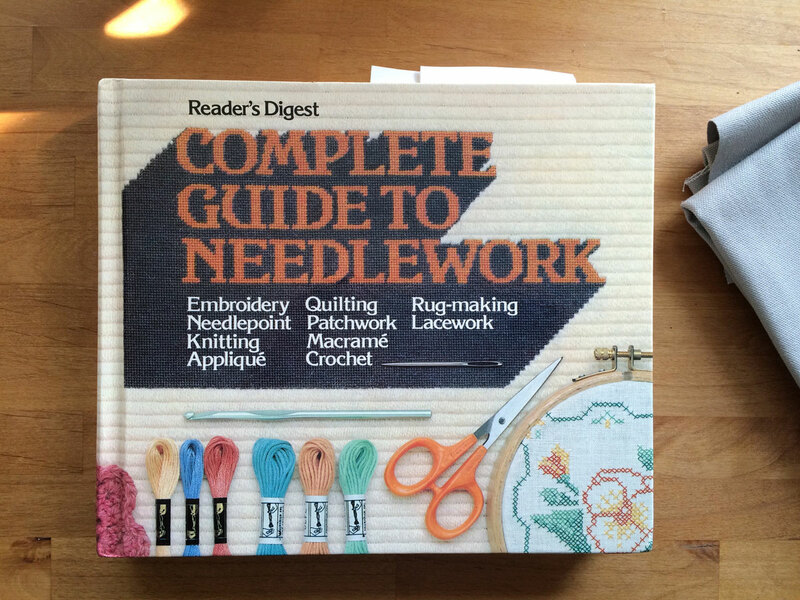 It also has knitting, crocheting, and quilting basics. If you ever see one of these at your local used book store, its well worth it. 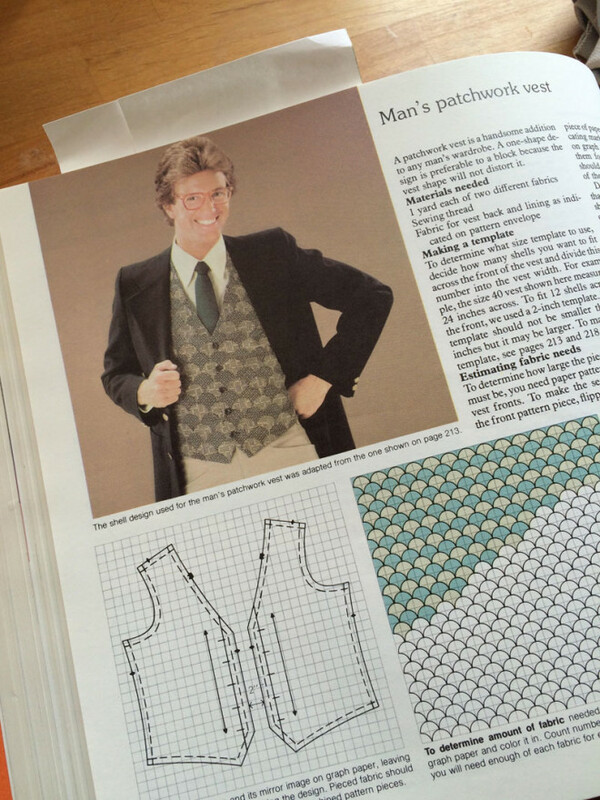 You can even make your man one of these stylish vests! Okay, so it’s a little dated…but the information is so good! 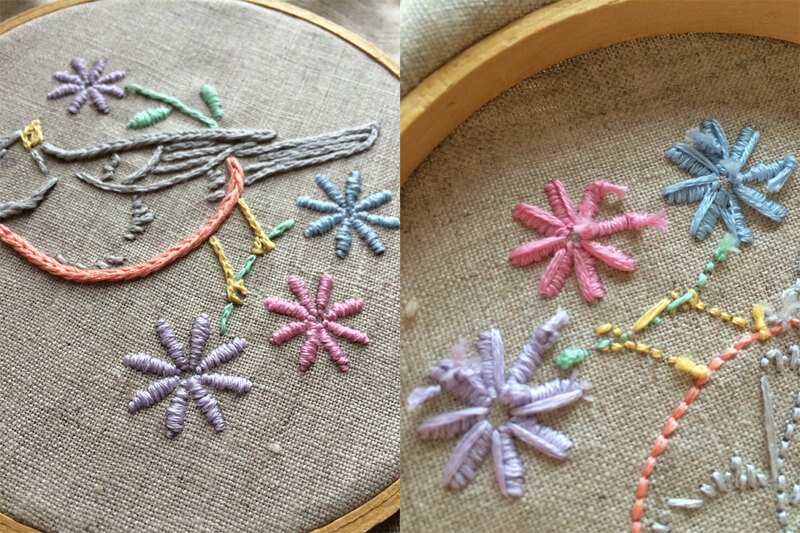 I pulled out a few different pieces of scrap fabrics and laid my embroidery floss across them to choose which one I liked best. I’m going with this light tan linen I used for curtains because I think the colors pop on it the best, plus it will match my décor. Next I went ahead and followed the instructions that came with the iron-on transfers. Turns out you can use them more than once and make multiple projects with the same iron on image. Nice. When cutting the piece of fabric you’re going to use, go ahead and actually put it in the embroidery hoop your going to use before cutting. I find I always need a bigger piece than I think, so measure, then cut. The transfer came off really easily and is nice and clear. I’m glad I picked a lighter-colored fabric so that it pops. 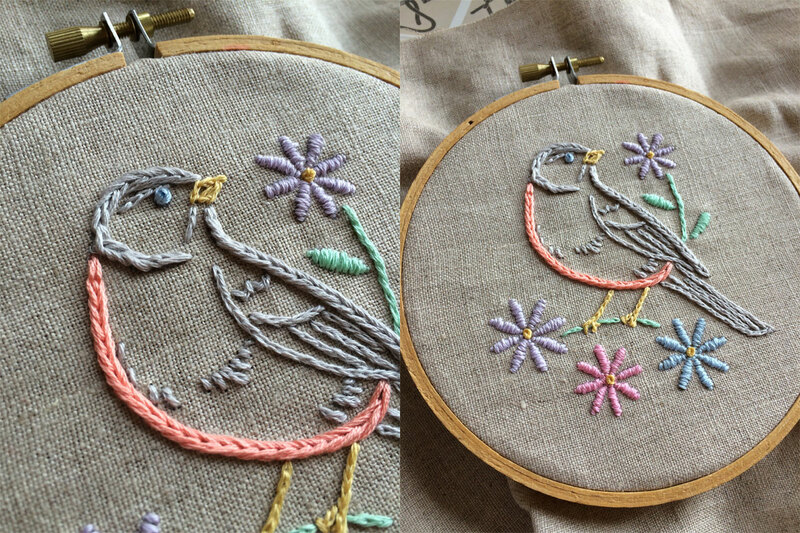 Place the printed fabric in the embroidery hoop and make sure to pull around the edges to make it nice and taught- this will make it easier to sew. 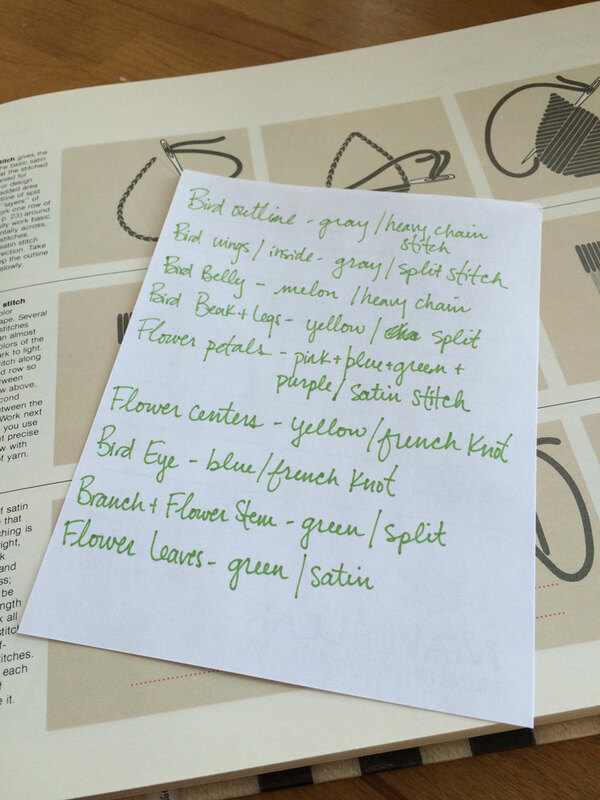 Consulting my book, I make a plan for what type of stitch I’m going to use where, and with what color. I’ll start with the heavy chain around the body of the bird. 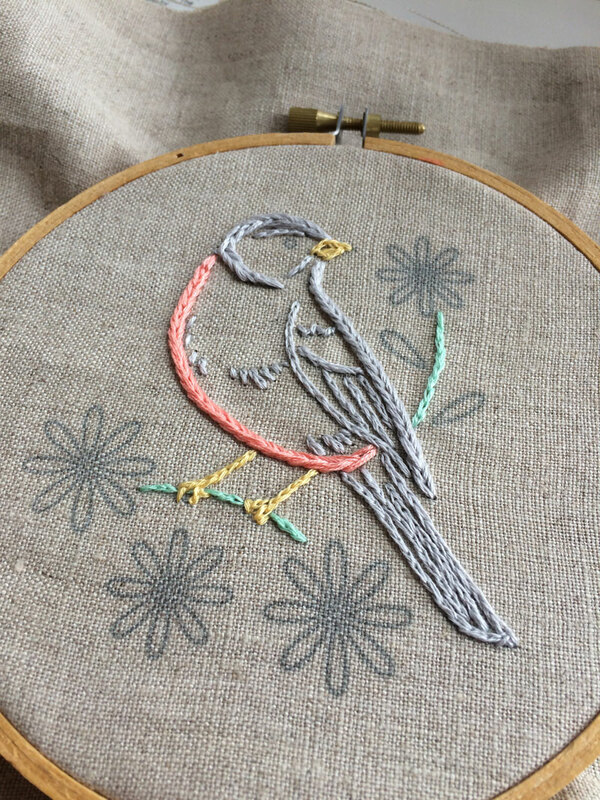 This is a slight variation of the chain stitch. It’s very thick and textured and kinda reminds me of feathers. Start by cutting a length of thread, something manageable, about the length of your forearm. Tie a knot in one end and thread the other through the needle. Choose a good starting point and start coming in from the back. To get this stitch started we have to do a little trick, but once you get going its simple! 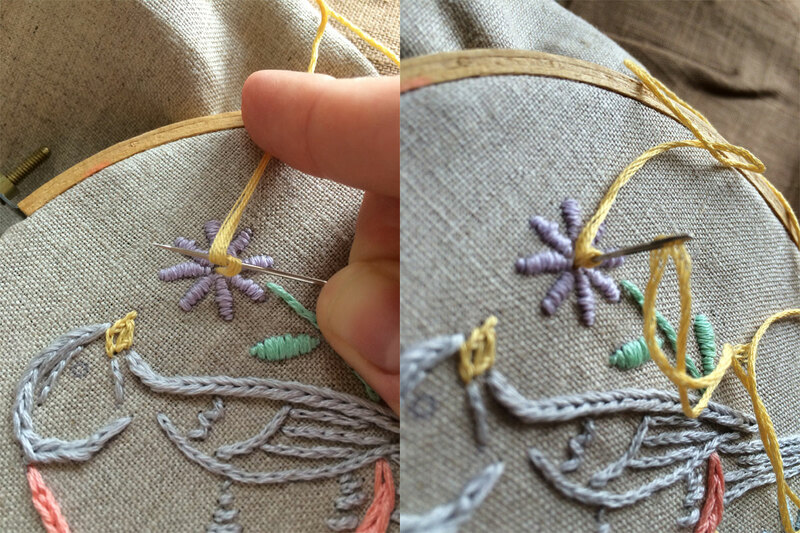 (1) Come up from the back, then go back down through that same hole (sounds weird, I know) but don’t pull the thread through, just poke the needle right back up through the fabric about a quarter of an inch ahead of the hole you started with. Before you continue pulling your needle through, wrap the thread underneath the end of the needle, then pull. You’ll see you’ve made a little loop. 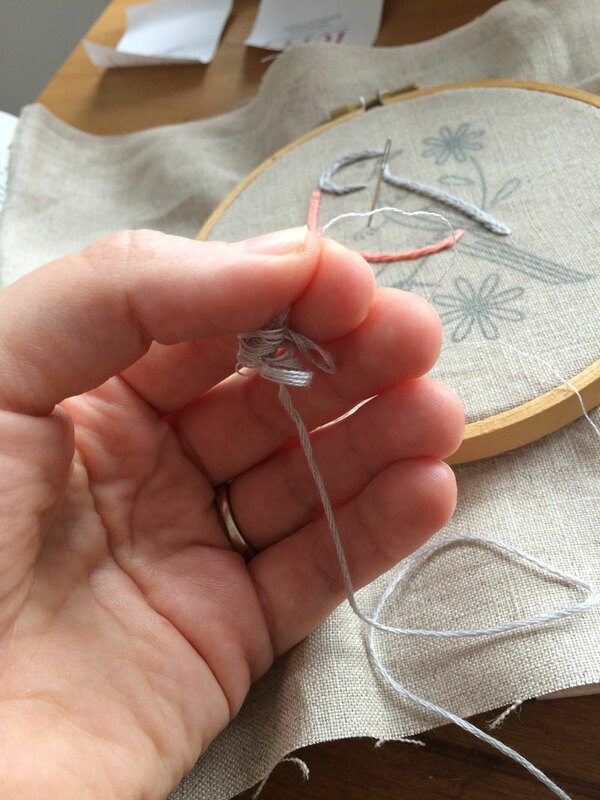 (2) Take your needle and make a stitch by re-inserting it right underneath that loop, then come right back up again about a quarter of an inch down. Now it will look like a loop with a little line at the very end. 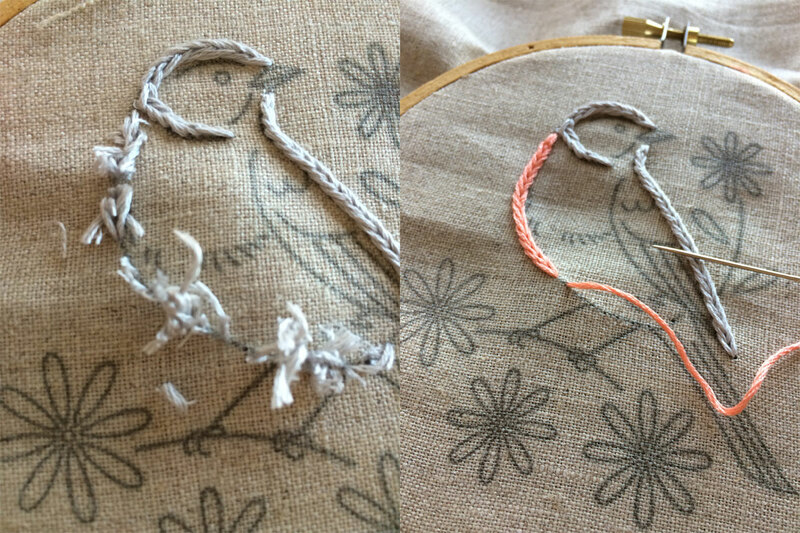 Take your needle and loop behind this little stitch, through the loop you made earlier. Then go back in the hole you came out of and up ¼ in down. (3) Now come up, go back through the little stitch you made at the bottom of the loop, back in the hole you came up through and out ¼ in down. (4) Now just continue looping back through, two stiches behind, back down and up. (5) If your thread runs short, just loop it underneath one of the stitches you’ve made on the back, pull it through the loop and make a knot. Then continue with your next length. Next we’ll learn the split stitch which is a thinner looking stitch. Since I will be doing detail work with this one, I decided to thin out my embroidery floss a bit. Just cut a length, hold it at one end and pull out each individual thread one at a time. I decided to use 4 pieces instead of the 6 original. For the split stitch, simply come up through the back, then go back into the cloth following your guidelines about 1/8” away from where you came in. When you come back up from the back to make your next stitch, split the stitch you’ve already made through the middle. Continue doing this, backing up on yourself, until you reach the end! Now that I’ve completed all the split stitch work, I’m going to do the satin stitch. 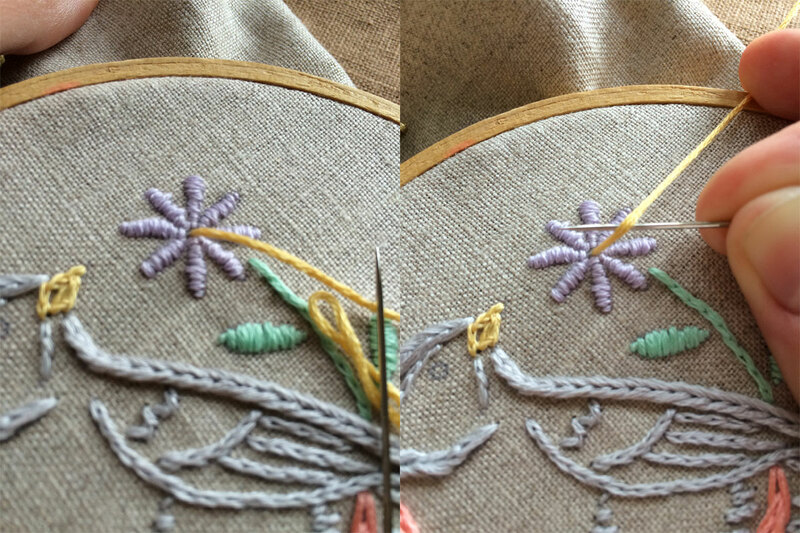 This is a good stitch for filling in small areas. It’s very simple, just stitch from one side to the other; across, across, across. Before starting this stitch, I separated all the threads from my length of floss, as before, and put all 6 strands back together again. This will help them to lie more evenly next to each other and produce a smoother looking surface. This part was more difficult to execute than I expected. Creating the gradient from narrow to wide to narrow again for each petal smoothly was a challenge. It’s not perfect, but it still looks good! 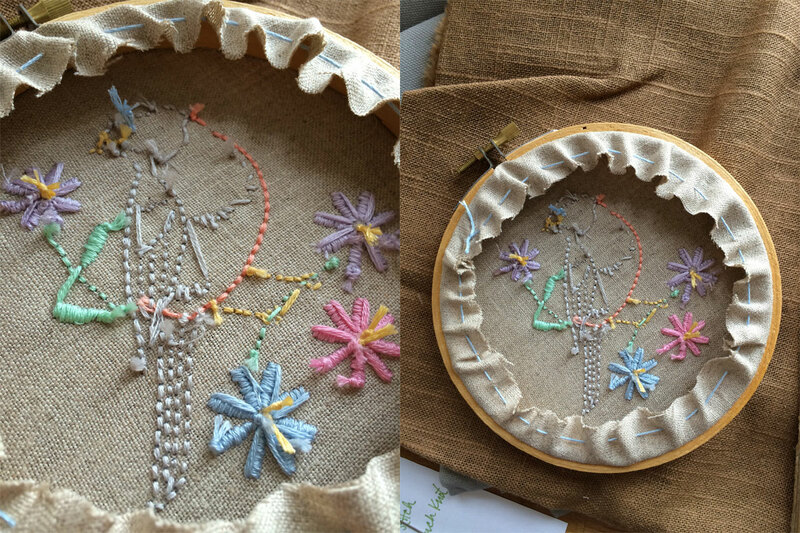 And the last stitch we’ll be doing, the French Knot, will finish off our project by filling the flower centers and creating the bird’s eye. 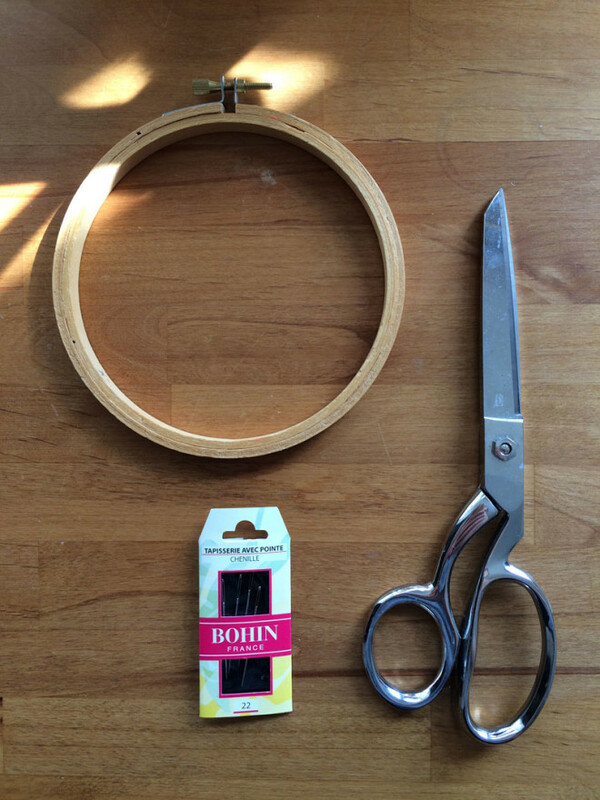 Prepare your needle with a length of thread, then come up through the center of the area you’d like to fill. Pull all the way through, then wrap the thread around the point of the needle twice. 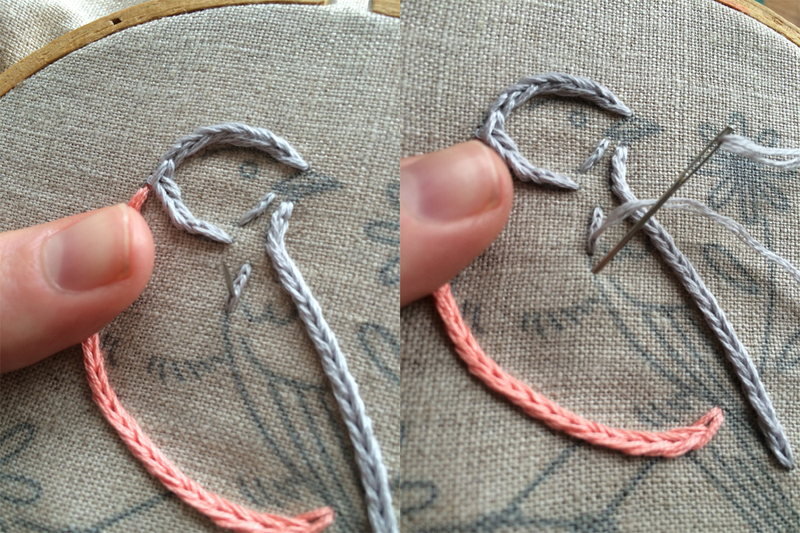 While keeping the thread taught, poke the needle back into the hole it came in. Pull tight and knot in the back and that’s it! For the eye of the bird, I wanted a slightly larger knot, so I wrapped the thread around the needle three times instead of two. To finish up the project, I trimmed the fabric around the edge of the sewing frame leaving about ½”. Then I just ran a thread through the edge and pulled tight to get it to pucker inside. All done! Whew! You did it! And now you can make so many more things! These little birdies would look so cute as a group of three, don’t you think? Feel free to leave any questions/ happy comments below and I will do my best to respond. Any ideas for what you’d like to see featured next? E-mail me at social@homespunindy.com.